Field Day brings forth a wide range of antennas used for the event. Clubs even have their own stock of antennas, hidden in local garages, to spring on participants if needed. Antennas have to be put up and taken down. Ham Radio rules apply here as well: everything will take twice as long as you think to put up and take down, so select something easier to do. Field Day favors working stations close-in relative to the world. Verticals with low angles radiation won’t help you work as many people as you need to, so try horizontal antennas that are not too high up. Monoband antennas will give you better SWR across the band and will help reduce inter-station interference. Nothing like operating 20-meters on your triband yagi with the 15 and 10-meter stations chiming in as well. Safety is a big deal here and people setting up antennas for an event are more likely to cut corners. Don’t do that; safety first. If you have a long wire or dipole or inverted vee…where will the ends be supported? The middle of a flat field doesn’t help you support dipole ends, so some other support structure will be needed. Pre-planning on the site will help. What are your favorite Field Day antennas? Easy. 135′ open wire fed dipole, at about 50′. Perfect! @Chuck -I agree. 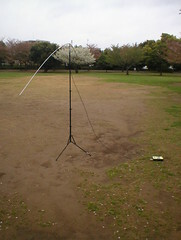 We have used this type of antenna on field day with great results. Long wires as well with a tuner, sometimes up only 20-feet.